This is a very nice hotel just off the 163 freeway. Staff was very helpful and pleasant. Outside the traffic is noisy, however, once in your room, it's extremely quiet. The room was a good size with two queen beds, cable TV, game boy and internet access. I will stay at this hotel again as I was extremely pleased. Very nice room with comfortable queen size bed. Loved the balcony overlooking the pool and lush garden. The price was fair the rooms are nice and comfortable and it has a nice pool area. Comfortable rooms friendly service and a nice relaxing pool area. Located in an industrial area hard to retrieve a taxi and the elevators are in a bad location. Man was great in check in he is a great employee. The cook was great and food was excellent. Our server was awesome. Room was to small for 4 people. The 245-room Courtyard by Marriott San Diego Central provides quality accommodation designed for both the business traveler and families on vacation. The four-story, non-smoking hotel is near the offices of Raytheon, Lockheed Martin, Kyocera, Northrop Grumman, and MCAS Miramar. Items included with the room rate are high-speed Internet access, local telephone calls, parking, a morning newspaper and coffee available in the lobby 24/7. There are five meeting rooms available for social or business functions. The largest can accommodate 200 guests. 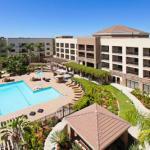 The hotel is minutes north of Mission Valley and a short drive from SeaWorld and the San Diego Zoo. Other attractions nearby include eight golf courses, Legoland, San Diego Wild Animal Park, Del Mar Racetrack and the Quail Botanical Gardens. All the guestrooms, and eight suites, have a work desk with high-speed Internet access, two-line telephone with voicemail and speakerphone, coffee and tea making facilities, Internet browser television with cable news and movie channels, pay-per-view movies, wet bar, pullout sofa bed, iron and ironing board, alarm clock and a hairdryer. There is a separate shower and a bathtub with sprays jets. The suites have a microwave oven and a refrigerator. Video games and players are available for rent. This hotel has an outdoor heated swimming pool, whirlpool and a fitness center. The hotels Gazebo Grill is open for breakfast, lunch and dinner. The Center Court Lounge serves dinner and room service is available from 5pm until 10pm. There is a 24-hour The Market offering a wide range of snacks and beverages. There is also a Starbucks Coffee on-site. Restaurants nearby include the Butcher Shop Steak House, Dennys and Casa Machado. The 24-hour front desk has safe deposit boxes and information on area events and attractions. Other amenities include a full service business center, a coin-operated laundry, vending machines, valet dry-cleaning, an ATM and a gift shop and newsstand. The happy band of employees and comfortable beds were two of the reasons that former clients liked this Courtyard. Several guests noted that the location was good, in a safe neighborhood, and it was different to have a full service restaurant on-site. Most guests said they would use this property on future visits to San Diego and no hesitation in recommending the hotel to others.